See come race day if it's as bad as Shanghai a few years back. Alex Rossi in for Singapore and 4 other races. I guess him being out of the running for the Haas seat helped him make this decision. 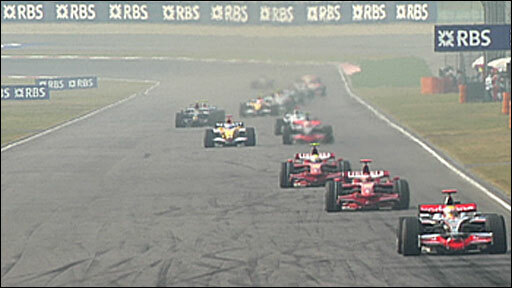 Better to have 5 races in Formula 1 than 0? Jarnooo a écrit: See come race day if it's as bad as Shanghai a few years back. Can't even seem to recall that. What happened then? Can't remember exactly which year, might have been 2008. It was just very smoggy. I remember it being worse than it looks here, perhaps it wasn't so bad. India was also quite bad. Either way, the important thing here (safety), is that a helicopter isn't required here, due to the close proximity of the hospital to the track. Wow! First time since Bahrain that no Mercedes is among the Top 2 (Hamilton 4th, Rosberg 7th). Vettel up to 1 sec faster on the longruns, but also both RedBulls faster than the Mercedes there...Wolff called their (competitors) lap times "spectacular". First Ferrari pole for Vettel! Completely destroying the Mercedes (by about 1.5 secs), and the rest of the field. Superb lap by him! Mercedes don't have an explanation. They just don't have the grip level their competitors have. So we're going to see a Ferrari or maybe RedBull winning this. I don't mind that at all! Haven't really looked at their times this season, but those Manor-Marussias...yikes! First Ferrari pole since 2012 btw. F1 forever a écrit: First Ferrari pole since 2012 btw. This must be the biggest surprise of the season by far. Some driver reactions are pretty hilarious! Nico Rosberg could not believe what he was seeing when he watched back Sebastian Vettel's pole position lap for the Singapore Grand Prix. Asked if he had ever experienced such a drop in performance at one race, Rosberg said: "Not this extreme, because we were so dominant and faster everywhere massively, then to go to the next race, we can't lose 1.4secs on one lap. I just watched Sebastian's on-board - I didn't want to - but I shouted out in the engineering room 'what the hell?!' It seems like he is on a different planet in some corners." Seeing the Mercedes in a "best-of-the-rest" role really takes me back! It seems like for years that's about what they could do and then go backwards during the race (if they made it to the finish line), with Vettel scooping up all the wins! Mercedes have always been far better in the race than qualifying. Perhaps they can give us a show in the race then. Hmm, why they took that chikane away? It was entertaining! McLaren isn't good at anything anymore. Wow, they're blaming Hulkenberg for the crash!